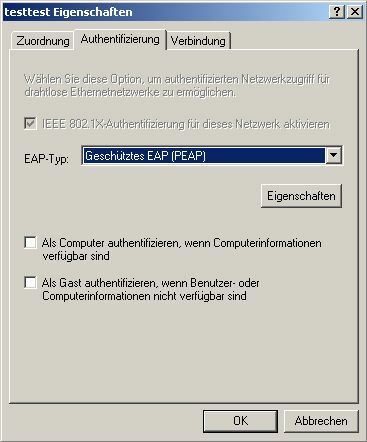 This Article describes how to build (and work with) a Certificate structure to have an own CA that works for EAP-TLS Client / Server Authentication or PEAP. We also cover the use on the Client side. 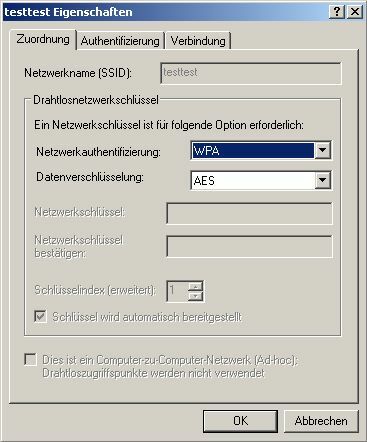 Because there are multiple ways we do not cover the Access Point setup (too simple just the IP-Address of your Radius server and the shared secret and your Wireless setup) nor the Radius server (need IP-Addresses of the AP’s as NAS-Client and the shared secret and include the Certificates to the right Places).For this please search the Manuals of your Vendor. The goal is to make the whole Certificate thing easy for you and rapid to use. At the beginning you’ll have to make the hardest Choice in your Life. 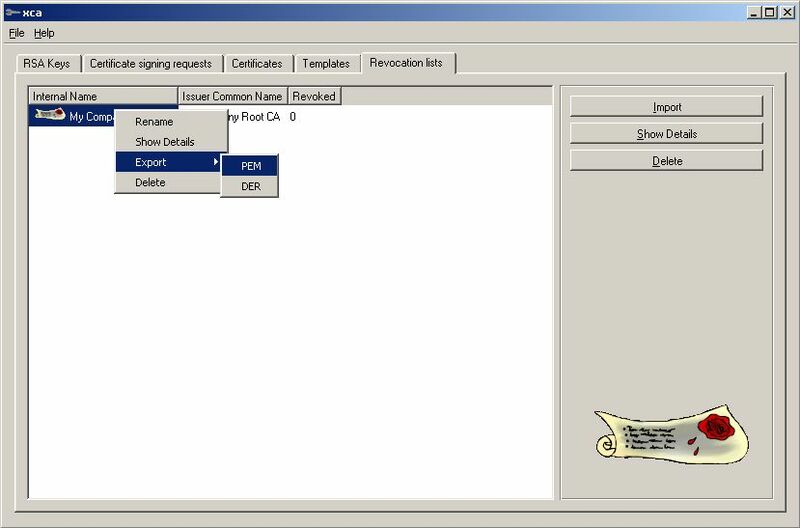 If you spoil it you can have lot’s of additional Work: Choose a PKI to work with. You may use what Vendors like Microsoft have build for you. If your Infrastructure is build with Microsoft servers and you plan a big permanent Rollout, you better use the PKI Microsoft provides (not covered in this Article). If you search for an alternative this Article shall be useful for you. · It is supported under Linux and Windows! · For TLS you don’t need the Client to issue a Certificate Request, then the CA signs it and sends it back. 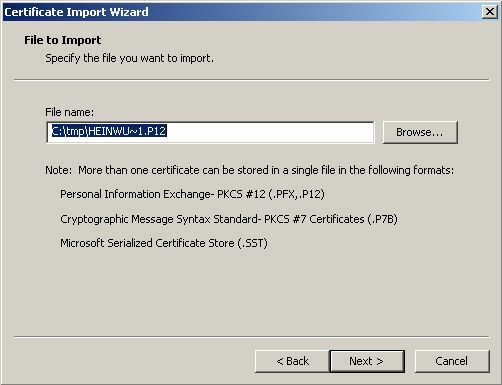 You can generate the Cert on the PKI, send it to the Client. He just clicks it for include and that’s all. 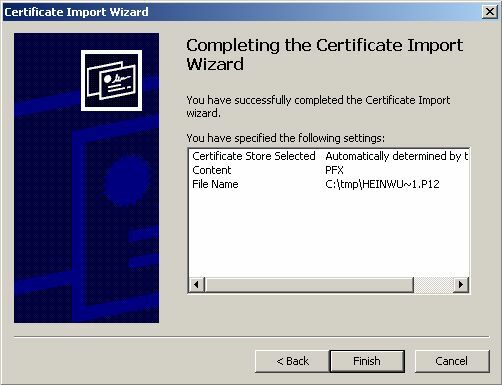 · It’s fast to use (GUI), however it becomes a bit unhandy for generating large numbers of Certs. So search for something other on > 100 Certs. 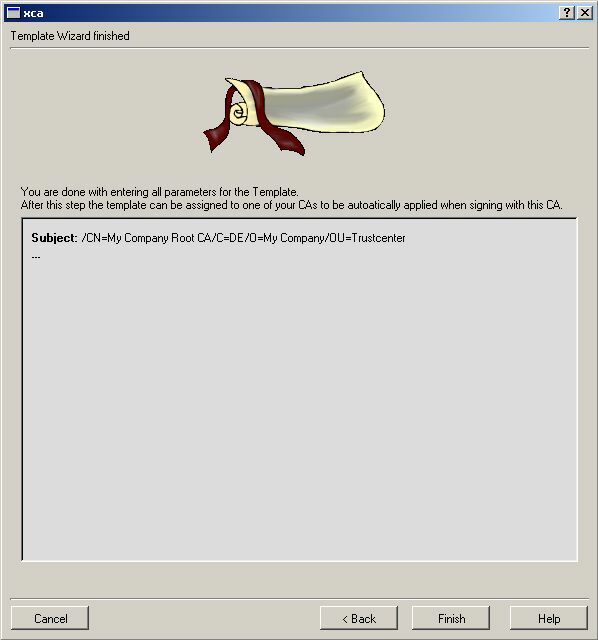 The Certs we will generate with XCA will have the same Credentials set and support the same attribute types as used when using the Microsoft CA. 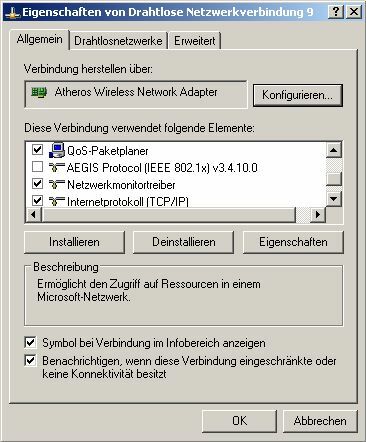 By doing so this works also fine as Certstructure for Rolling out EAP-TLS (or PEAP) for WiFi Clients. Now let’s do something practical. Download XCA and we start. 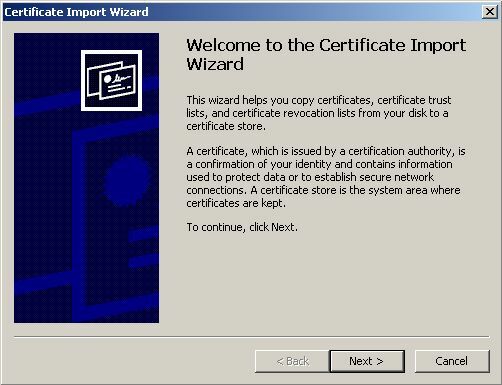 After installing XCA you need to add attributes that Microsoft is using in their Certs. 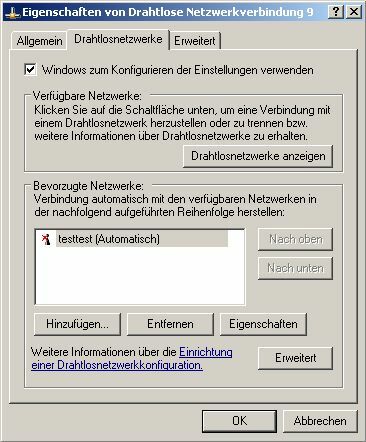 Under the windows environment search for “oids.txt” (try c:\Programm Files\xca\oids.txt) and add the two Lines show in red below to the File. 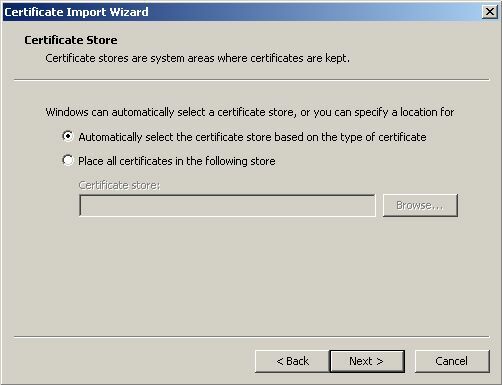 You must have these OIDs in your Certs at the right Places or the native Windows Client will not work! This is a link to the File to write. Open the default DB. Note that is has a Password but is NOT encrypted with it. So make sure nobody can get access to it. EVER! 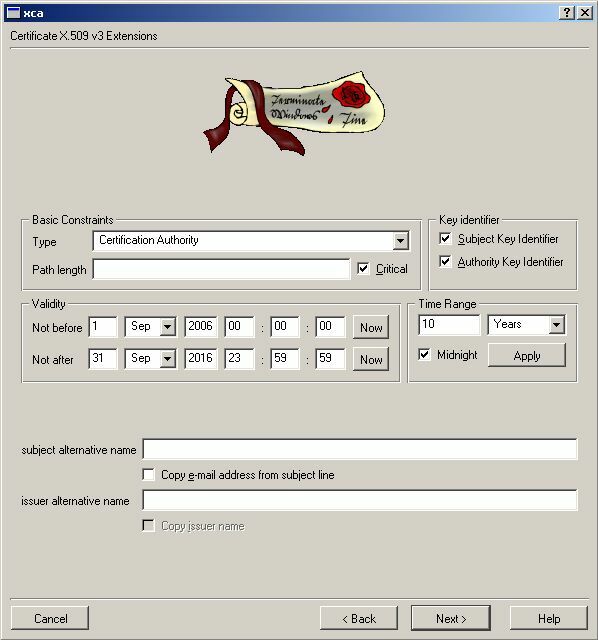 You can generate Keys in advance or when you generate the Certs. 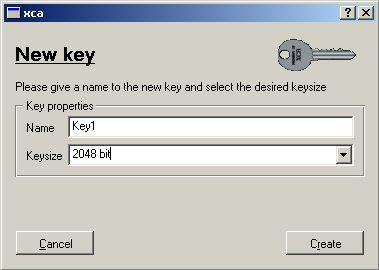 Make sure you don’t go below 2048Bits in your Security. 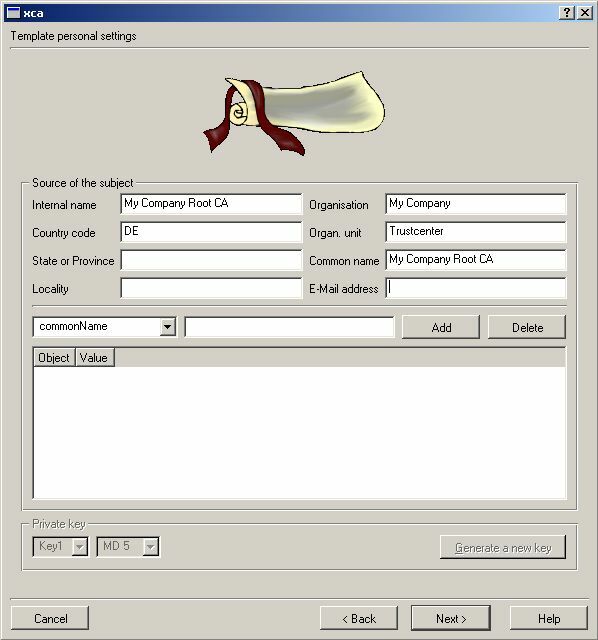 We now make a Template for your own Root CA. If you want to avoid most of the typing work just import the following File. 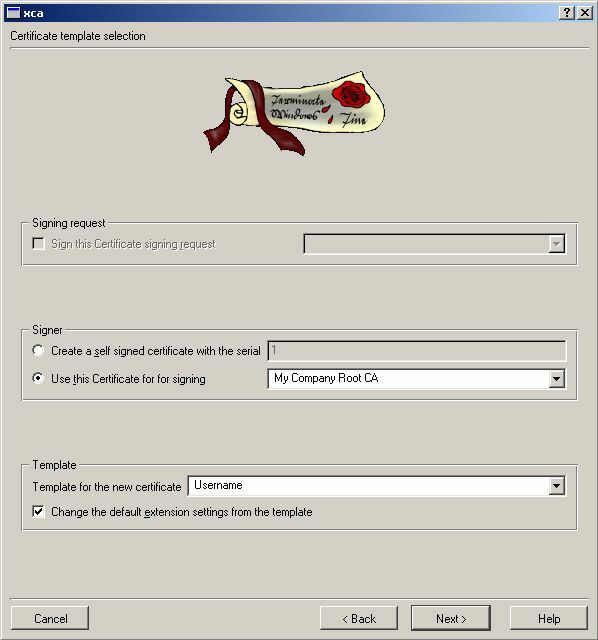 Make sure your Organisation name is the same in all Certs you’ll use. 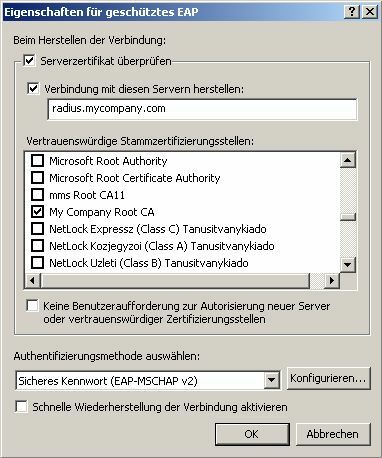 Make sure the location for your Certification Revocation List is reachable for the Radius server and the Clients. We don’t need ANY Netscape Stuff in our ENTIRE Environment. Netscape CA is History. 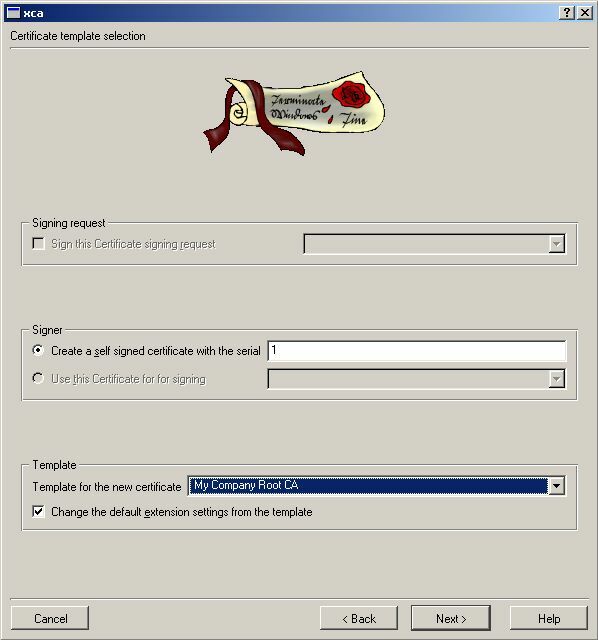 We now make a Template for your own Server Cert. If you want to avoid most of the typing work just import the following File. Note that all other things shall similar to your Root CA. This Section is only needed if you plan to use EAP-TLS. For PEAP only you can skip this Section. 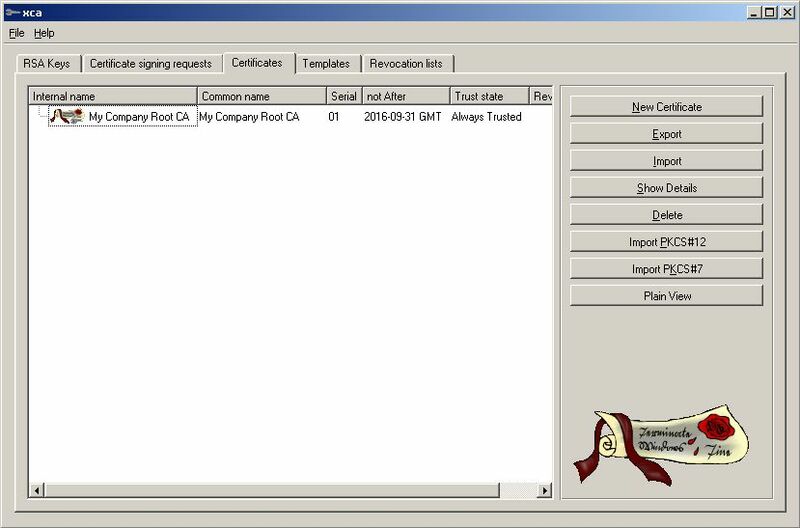 We now make a Template for your own Client Cert. If you want to avoid most of the typing work just import the following File. First we need the Root CA for all things we will be sign. Make sure Internal/Common Name match the DNS-entry of your Server. For TLS we need Client Certs. They are now generated. SKIP this section if you’re only doing PEAP or TTLS. Save this and give it to your Clients for import. 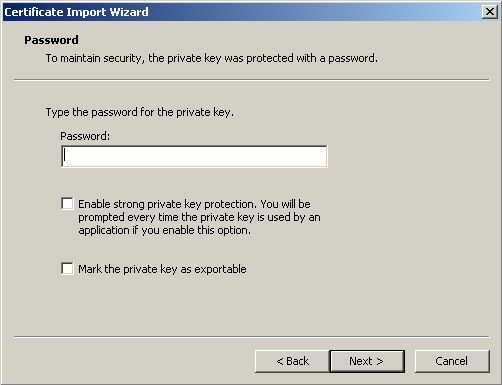 You need the private part as well but how to export the private Key? 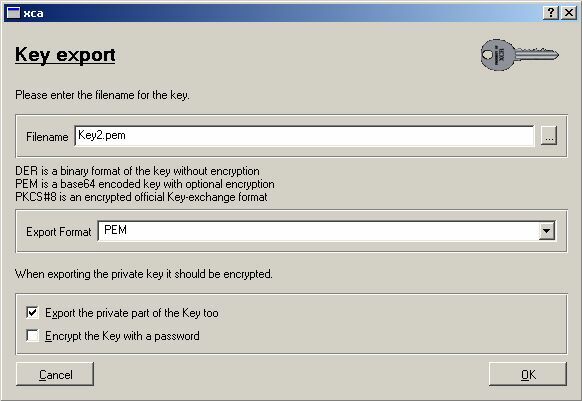 It tells you how the Private Key is named so “Key2” is the private Key to export. Both Parts (public/private) and the public CA part shall be used to import in your Radius server. Sometimes you’ll have to export other structures such as PKCS#12 but XCA may do this as well for you. Make sure the Radius server can have access to your CRL hosted on your Webserver. Now build a Certficate Revocation List. This have to be loaded after every change to your HTTP server. This is the whole Cert Stuff you need to know. Sounds big but this if only due to the many screencaptures we’ve provided. Mostly it’s only clicking ahead if you know how to. We now show the Microsoft Client Side but make sure you’ve installed and setup the Radius Server before. The First Setup is for PEAP (and TTLS). A Client need to Double-Klick on your Root CA’s public like “My Company Root CA.crt”. It will import your own Root CA into the Clients trusted Root CA memory. This is strait forward. Just click “Install”, “next” or “yes” until Windows said your Import was done. Now we setup your Wireless connection. Activate your Wireless card and go to Properties. 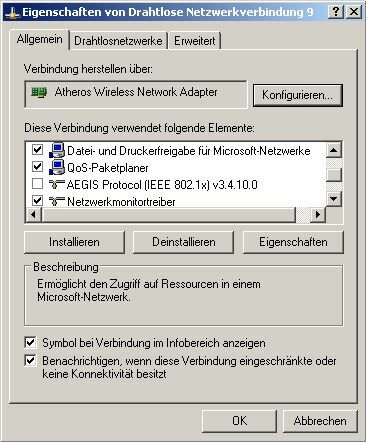 Make sure you’ve disabled a third party 802.1x Supplicant like AEGIS. Hope your Network can support strong encryption with AES. Choose PEAP and go to Properties. If you want to use own Usernames / Password uncheck this. Now we do the TLS Setup on the Client. A Client need to Double-Klick on his own Cert from the CA like “Hein Wupptich.p12”. 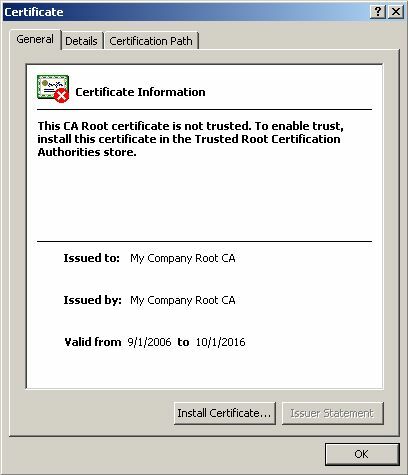 It will import the Client AND Root CA (we exported it with the whole Cert-Cain). This is strait forward. Just click “Install”, “next” or “yes” until Windows said your Import was done. Choose “Smartcard or other Certs” and go to Properties. Hint: If something doesn’t work and you are sure it’s not the attributes you use in a Cert check the Clock settings on both sides (Server/Client) and make sure ALL Certs are in the Time range. If your Root CA or Server or Client Cert is not active it’s not working. It’s wise when you issue a Cert to choose a start day / time retroactive 2-3 Days before generating it! This Article is Copyrighted 2006 by mms communication AG. All Rights Reserved.